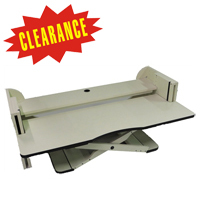 The Desktop Elevator from OIC Innovations is a complete desktop add-on solution for creating a sit-stand workstation. The large worksurface area and sturdy construction allow your keyboard, mouse, and monitor to effortlessly move up and down to the desired height (from 3" above desktop while sitting and 5" to 17" above desktop while standing). Two model sizes are available with 24" or 27" depth, both with a width of 48". The Sit-Stand SmartMat from OIC Innovations offers comfortable cushioning to users when standing, combined with the ability to reposition the mat using only a single foot. By pressing down lightly with one foot on the Activation Pad located at the front of the Sit-Stand SmartMat, the user releases the non-slip backing, and can easily slide the mat out of the way without having to bend down. Users who switch frequently between seated and standing work positions, or who need to reposition the mat often, will find this ease of transition a vast improvement over traditional anti-fatigue mats. 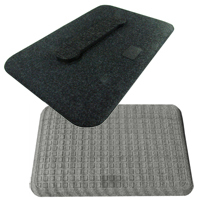 Anti-fatigue mats are often recommended for users at both standing and sit-stand workstations, as they help to reduce fatigue and strain in the legs and lower back. At a Sit-Stand workstation, the mat must be moved out of the way when the chair is moved to the desk since the wheels on most office chairs tend to sink into the mat and lock up. Traditional anti-fatigue mats generally consist of heavy rubber or dense foam and are typically moved out of the way by hand, bending and twisting at the waist and hips to do so. For users with pre-existing back problems, who may well have chosen to stand while working to address those very problems, this type of motion raises serious concerns. The core of the SmartMat is a lightweight 5/8" rubber compound which provides a comfortable degree of cushioning. The cushioning effect of the core is enhanced by the woven fibre carpet surface. Unlike more common rubber or foam mats, the fibre cover provides breathability, offering users a comfortable surface should they choose to stand without footwear. The Sit-Stand Smart Mat also includes a Foot Wedge that can be used for extra cushioning or to encourage movement of the feet by creating a multilevel surface. It can be placed anywhere across the mat surface and can be repositioned easily with the feet. 'Surface Specific' SmartMat models are available in both Classic Grey and Charcoal Black for either hard floor or carpeted surfaces.